A little bit of everything. But mostly about knitting. Well, anyway - here he is. I miss his fuzzy face. I'm having problems inserting pictures into my entries. It worked yesterday, but now the photo is gone! I'll figure it out later when I've had some caffeine. A few months after I adopted a gray and white domestic short-hair cat; Rascal (who fit his name PERFECTLY), I had to move back home while waiting for my first ever house to be built. There was a gap between my apartment lease and the new property closing by a couple of months. Mostly Rascal was relegated to the basement where the TV room and my Granny's bedroom, bathroom etc, were located. There was also a finished bar in the area next to the TV room. The bar was really more of a catch-all than anything else. Books, plants and some clothes that Granny was planning on ironing. The ironing board was always set up perpendicular to the bar, since that was the most convienent way to position the iron with the wall outlet. Rascal loved to jump up on the bar and investgate and I suspect to survey his surroundings. My Granny had a gray sweater that I brought her from London. It was a fuzzy cardigan, and although it was lightweight, it was warm. She wore it often. During that time, Rascal would sit on the bar and watch her iron. One day he got it into his kitty brain that the gray sweater was the enemy and he pounced on my poor little 80 year old Granny's back. He scared her, and I'm sure she sacred him right back. Never to be one to back down from a challange, my Rascal hunted my Granny's gray sweater till the day we moved out to our own place. If she was sitting watching TV, he'd pounce that sweater from behind. Any opportunity, he took it and he always caught Granny by surprise. 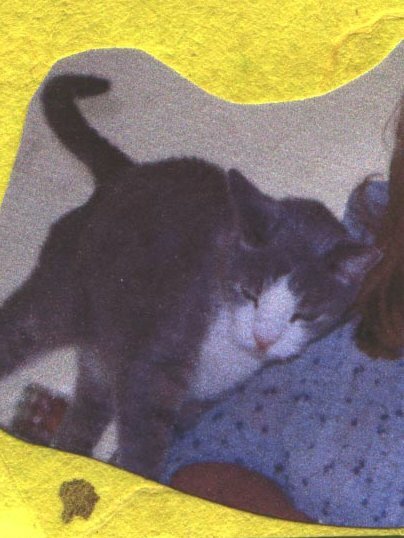 Our family cat Benji once jumped off a chair to head outside through the sliding glass door. The door was opened, which he was well aware of, but he didn't know the screen was closed. He crashed through the screen in such a way that he left a perfectly cut cross that wouldn't allow any bugs in, but became the perfect cat door. My Dad kept wanting to replace the screen, but my Mom wouldn't let him because in good weather, she never had to worry about letting Benji in or out. I finally made the decision that I needed to put Rascal (the elderly cat) to sleep. I called a family friend who works in a vet's office and made the arrangements. My brother drove us there and our friend was working that Saturday, so I had lots of moral support. It was very peaceful and I got to hold Rascal through most of it. The vet was wonderful and he said that I made the right decision. My brother is the best. He stayed in the room with me, even tho I told him he didn't have to. Then he took me out to brunch and I did end up eating a little in spite of the fact that I had no appitite. The horrible part was that as I was carrying Rascal out of the house, I tripped on the LAST STEP and fell. At least he landed OK and without a big crash. I wasn't so lucky. I landed on my knee and twisted my ankle and as I was limping into the vet's office my toe started to hurt. Now that's the worst of it. I think it's broken. It's swollen and black and blue, my knee and ankles both hurt. Can't I just have one pain at a time??? So last week I hobbled around work (aka the Sick Ward) and tried my best to stay away from all the people who were hacking, coughing and sweating. But it was to no avail. Come last Saturday night the cough started, a deep rumble in my chest and body aches. Sunday I wasn't any worse, but not any better either. Monday I had 102 degree fever. The doctor put me on anti-biotics immediately. I wasn't any better on Wednesday, so back to the doctor who took me out of work for the rest of the week since I have "asthmatic bronchitis". At least all the bed rest kept me off my feet and the ankles and toe are much better. I'm really looking forward to Spring so I can open up the windows, blow out the "bad vibes" and start fresh. Surprisingly my Mom suggested that I get a bunch of dried sage so I can insence the house. That kind of shocked me coming from her. Now I have to find a little magic shop or a place I can find wicca supplies so I can do this properly. Get all the bad ju-ju out of my house! My downstairs neighbor is in deep financial trouble. She has almost had her place foreclosed on twice that I know of and I don't know how she keeps getting out of it. In the past she has asked me to lend her some money, nothing more than like $40 or $50. She has always paid me back in full when she said she would. Early last week she calls me and asks if she can borrow $100. I don't have it to lend to her, not to mention I really don't want her to think I can always lend her money when she needs it. So then she tells me that her brother had just driven up to NJ from FL because her Dad is back in the hospital in ICU. No sooner did he arrive here in NJ than he had to turn around and drive back home because one of their dogs was very ill and dying. He and his wife are both unemployed and she doesn't drive so she couldn't get the dog to the vet in time. My neighbor gave him money for gas so he could get back down there and also for whatever vet bill there was (once the SIL got the dog there) and for cremation of their pet. A couple of days later while on the way home I get a call on my cell and it's my neighbor. She asked me if I could stop at the bank and take out money so she could borrow it. She didn't have money to give to her kids for lunch for the next couple of days. I got so mad. I told her no, I didn't have money she could borrow. Then she tries to make me feel guilty and I got madder. I hung up quickly after saying something lame. Can you even believe the nerve? She chose her brother and his dog over her OWN KIDS. Why should I feel bad about that? She made her choice and why should I have to bail her out? NO!!! The very next day I broke out in a rash all over my head, face and neck. Lovely. I slap on an extra heavy coating of make-up and head to work. I can't take Benadryl which will stop the itching because I'll be asleep at my desk, so I deal with the itch and the rash till I get home, take a Tylenol PM (has Benadryl in it) and crash out. I wake up Friday morning with the same rash, only redder and hives on my eyelids and under my eyes (on my eye bags). I go to work without make-up or contacts and try my best to hide from the general public. I still have the itchy rash. I have no idea what it's from. No new products (hair, make-up, lotions, shampoos or conditioners, detergents, soaps, etc). I talked to my Mom on Sunday and she told me she thought my neighbor gave me the rash. Ain’t stress grand? So now I'm wondering what it is with standing up for myself and this stress induced rash thing. Is doing what's right for me and what I believe in so hard that I end up with actual physical ailments? At least when I was a doormat I had nice clear non-itchy skin. It's really a toss up what I prefer right now.